Practice nurses are qualified and registered nurses. They can help with health issues, healthy living advice, blood pressure checks, travel health advice, and dressings. In addition to this, they also run clinics for long-term health conditions such as respiratory ailments, stroke, diabetes, and carry out cervical smears. Sandy assists the Practice Manager dealing with finance/staff and the daily running of the practice. She is responsible for managing the administration team within the surgery. 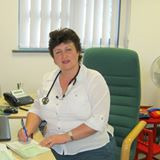 Sandy is also responsible for cytology admin, coil fitting/ removal and post natals appointments . Sandy also deals with the doctors and staff rotas. Sandy is responsible for Health & Safety issues and Staff Fire Training. Dealing with financial claims, patient audits, patient records and practice searches.